Like many, I was pretty bummed by the removal of kombucha from markets. Granted I save a lot of money not being able to spend $3 a bottle, but I miss having it as a pro-biotic option to sip on while browsing Whole Foods. You can still get kefir water from Whole Foods, but the few store-bought varieties I’ve tried have been very expensive and bitter, but also having less calories and a seemingly improved affect on my insides. 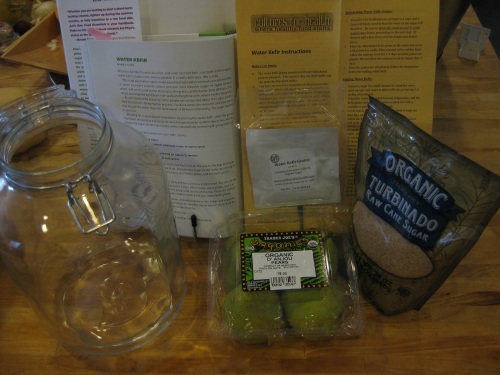 In the video above, Ani makes home-brewed kefir water look like a snap – so easy that I wondered why I’d ever pay $4+ for a single serving bottle again. Also Ani mentions she likes to have it before bed for maximum benefit. One habit I have not given up is an occasional glass of red wine, or half glass since I have an incredibly low alcohol tolerance. And sometimes I’ll sip on it while watching TV before bed. My hope is to replace that with home brewed kefir water for regular probiotics and to ward off any digestive drama that might interfere with my sleep. Fresh fruits, ginger and other ingredients depending on the recipe. 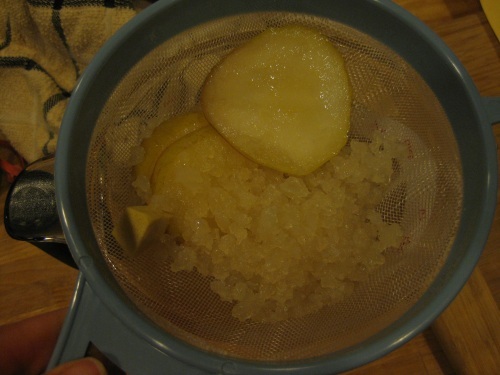 For my first batch, I decided to follow the exact recipe from Ani’s video above with fresh pear slices and ginger. 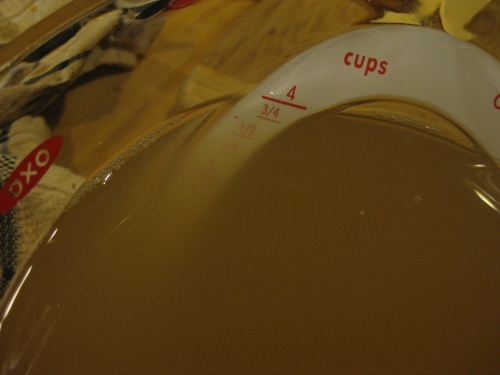 Note that water kefir grains should not tough metal because it could damage the grains, use glass, wood, plastic, etc. as an alternative. I had to hunt a bit for decent fine plastic mesh strainers for the job as well as make sure the contents of the jar did not tough the metal clamp assembly when pouring out which was no biggie. 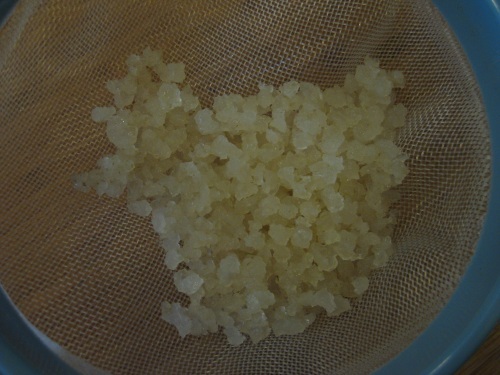 I first had to rehydrate the water kefir grains by soaking them with sugar for 3 days per the included instructions, then I was ready to rock on my first batch. 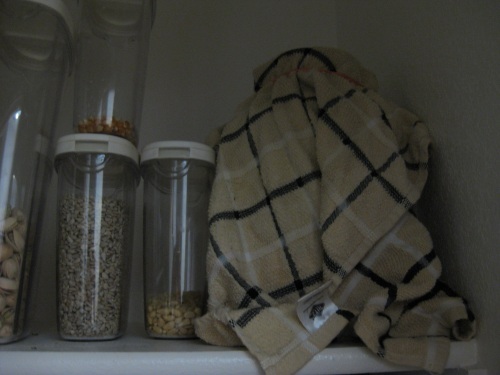 As she recommended, I covered the jar with a towel and stashed it on the top shelf of the pantry for 2 days. When I pulled it down, it looked a lot like the jar in Ani’s video. 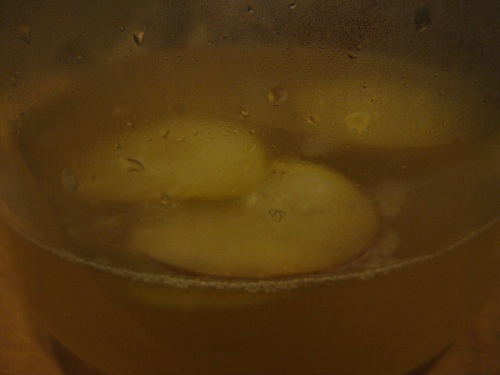 I carefully strained out the kefir grains, pear slices and ginger and tried poured my first glass. The verdict? It was like a sweet pear cocktail with a slight tang, not bitter at all and very pleasant chilled. It did help settle my insides, but not like the bottled stuff I tried at Whole Foods because my kefir grains are young and will get better with more batches. So naturally I promptly started lemon batch for the next round now brewing in the pantry. My take on home made kefir water is very positive so far, making it is easy and much cheaper than buying it. 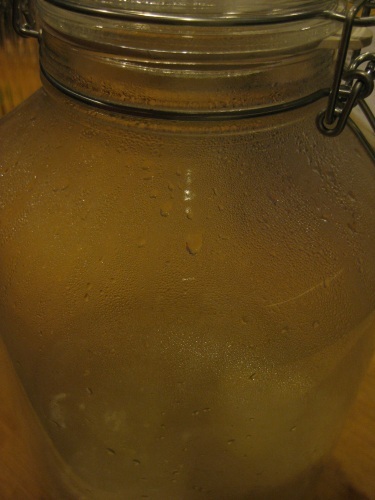 Have you ever tried kefir water? Would you try making it at home? congrats on your first water kefir and success!!!!!! 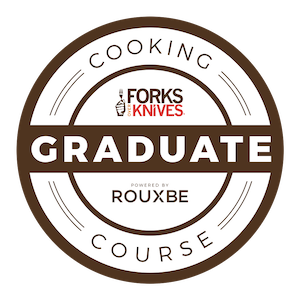 I think you are smart that you didnt fool around w/ the recipe, you just did it as is. Very smart! I have made coconut milk kefir before. i do use starter from WFs that technically grown on a dairy base. It’s one of those shades of gray that does not matter to me. I know Ani recommends against powder starter, whatever. I just bought her cookbook! I’m glad your kefir turned out well! 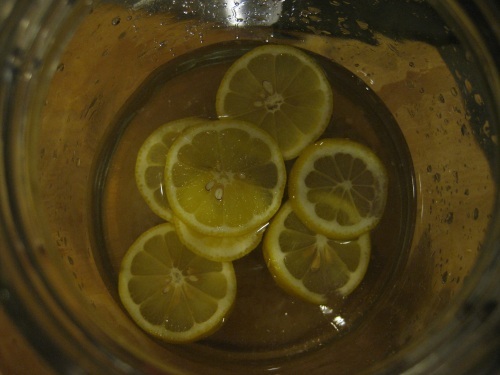 I have never heard of kefir water, but go you for being a super rockstar and making your own at home!! I MISS kombucha , and cant wait for it to come back, I really am not that creative to make my own kefir water or kombucha at home, Averie made her own kombucha and she said it is so good!! SO Im going to go to Sandiego and enjoy hers!!! I wish! 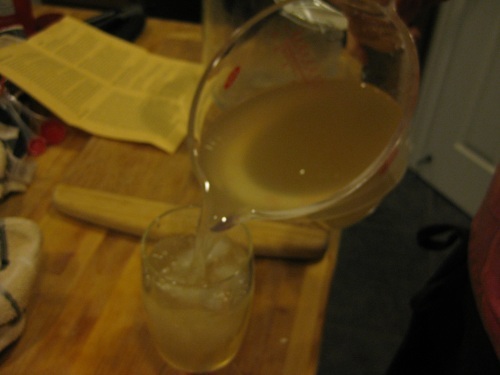 i have never tried kefir water…..i am still crying over the kombucha and may not ever recover! hope you have a great weekend christine! Kalli, you should totally try making this at home and have it whenever! This looks fantastic! Ani is so inspiring and I love her recipes. 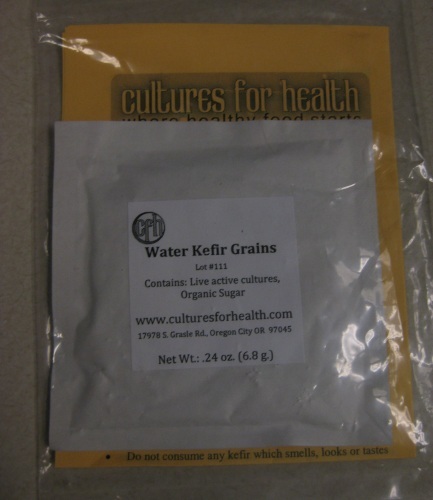 I’ve never heard of water kefir grains – I bet it takes about 10 years for them to reach the Swiss market ;). 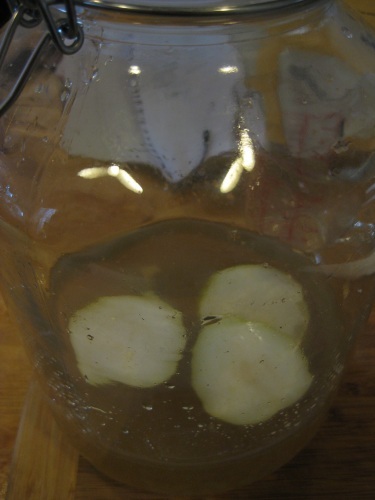 I think homemade-fermentation is so cool! I’m a fan of yogurt kefir so I’m sure I’d like kefir water. The first homemade experiement I’d like to do (successfully) is make thick yogurt!